We are a group of award winning Chicago architects and designers creating visual commentary on the ridiculous nature of our current political environment. We see design as our path to reinforcing a sensible community. Our projects are intended as bold visual responses to the loud, illogical and frequently hateful expressions that pollute the activities of our current U.S. leadership. We intend our projects to be a gesture in support of those of more rational, optimistic and inclusive minds. Please see our observations below. Two pigs down. Two pigs to go. Four more is unimaginable. In 2017 we proposed the installation of four inflatable pigs to block the T R U M P building sign in Chicago. The London bus sized inflatables had many references (Orwell, Pink Floyd’s Animals LP, when pigs fly, etc.). Their primary charge was to provide visual relief to the citizens of Chicago. 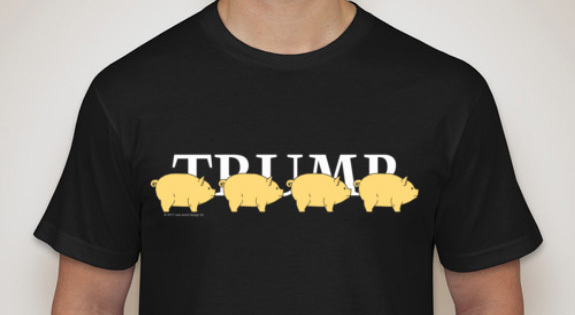 Those that know the project will recall that there was a pig for each year the world needed to endure Mr. Trump as President. Unfortunately, this unimaginable fiasco continues. We have recently updated the project imagery to “kill” the first two years of our national tragedy. For more information, scan below to the Chicago River Folly. A 30 foot “picket fence” (recalling a time when America was great - per Mr. Trump), gold finished and lethally electrified via new coal plants. We propose to build the prototype wall around the Mar-a-Lago compound by raising money through a GoFundMe campaign. Since his campaign, we have found Mr. Trump’s promised border wall a grand illogical absurdity. 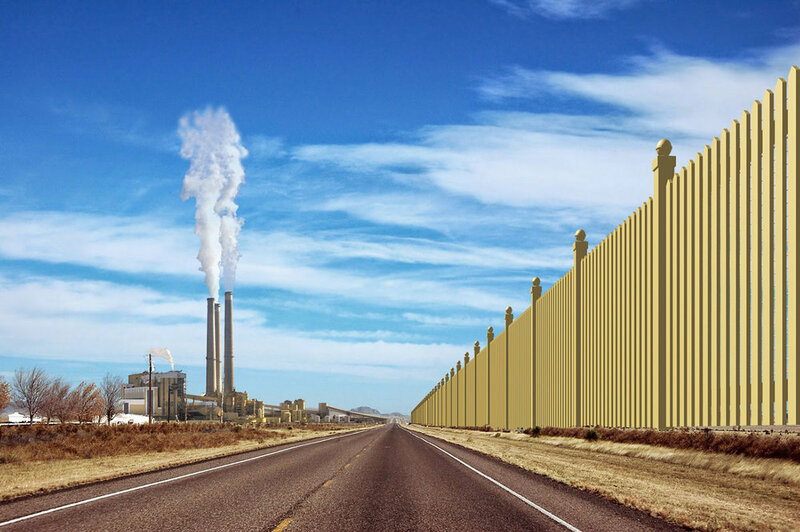 From this ongoing source of frustration our designers decided to try to envision what sort of preposterous “wall” Mr. Trump might design for himself (and his constituents). Over a few weeks of discussion and design time we conceived of the features represented here. We felt it suitable that the wall be mocked up (for his review and approval) at his de facto presidential residence, Mar-a-Lago. Presented here is a wall concept as contrived through the Trumpian lens. We propose that a prototype be installed around the Mar-a-Lago compound to make it easier for Mr. Trump to review. This would serve productive on multiple fronts. It would be a legitimate constructibility test, It would provide a practical assessment of real cost. It would allow for aesthetic refinements (correct gold finish, proper picket scale, finial shape, etc.). The lethal shock system could also be tested (in this case, the electrified side would be on the inward side to keep the dangerous people from getting out). Our team proposed funding this prototype through a GoFundMe campaign. 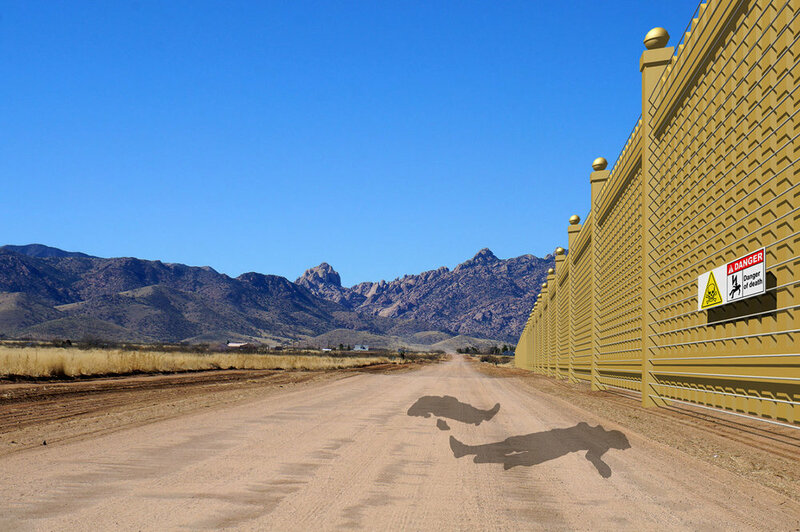 We see the prototype as a moral alternative to the Trumpian supporter’s GoFundMe effort to amass donated funds for the irrational and inhumane border wall. The benefit to our wall effort was that in the event the wall was not built around Mar-a-Lago (it was not), all funds went to the International Refugee Assistance Program. A “beautiful” 30 foot “wall” designed to look like a giant picket fence, recalling an age when “America was great”. It’s a wall but a fence. The bad guys on the other side can look through and imagine the riches and moral integrity of being American. Realized in a gold colored finish, speaking to Mr. Trump’s decorating taste. Lethally electrified on the Mexican side to keep out the droves of bad hombres (rapists, drug dealers, terrorists, murderers & immigrants and their children). The “wall” would be electrified by six new coal fired power plants built along the border, further supporting America’s fossil fuel future. To be built with Mexican labor and paid for by Canada (USMCA, trade gains against the Canadian dairy market). Total cost: $5.7 billion (excludes reality when determining cost and annual maintenance). Originally conceived in response to the 2016 presidential elections, Flying Pigs on Parade has garnered global exposure and acclaim. After two years of the Trump Presidency, the design’s message for Truth and Decency in government is still sadly relevant. The inflatables were to block the contentious T R U M P sign at Mr. Trump’s Chicago tower, providing visual relief to the citizens of Chicago. The project, intended for deployment in 2017/2018, was ultimately rejected by waterway management officials. 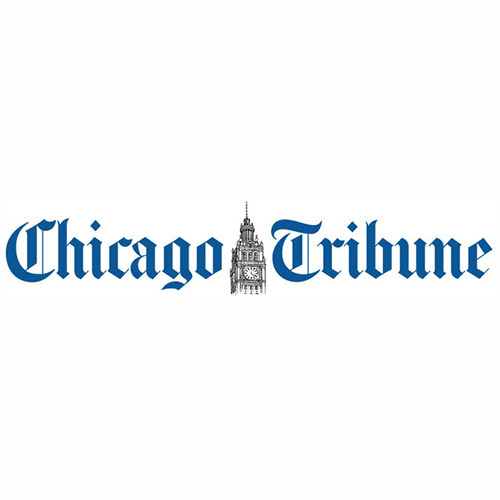 The inflatables block the contentious T R U M P sign at Mr. Trumps Chicago tower, providing visual relief to the citizens of Chicago. George Orwell’s 1945 novella Animal Farm depicts four fiendish swine (Old Major, Napoleon, Squealer and Minimus). The interpretive message of Animal Farm is unfortunately highly relevant again. In 1976 Pink Floyd flew a giant inflatable pig over the Battersea Power Station for the Animals album cover shoot. The album is a musical interpretation of George Orwell’s allegory. The prospects of Mr. Trump winning the election… “when pigs fly”. The gold color of the pigs speaks to our leader’s penchant for gold leafed interiors. Four pigs for the four years (minimum) the world will need to endure Mr. Trump as President. The pigs fly eastward in the direction of Washington, D.C. Ultimately, this is about RATIONAL DESIGN and is in direct contrast to the chaotic nature and bizarre antics exhibited by our current leadership. Roger Waters (Pink Floyd) has generously given his approval to replicate the original iconic Battersea pig for this project and its imagery. To help fund this and other “statement” projects, please see our MERCHANDISE.